22-year-old kills mother, brother, mob kills father in vengeance. Police at the murder scene for investigations. KALUNGU. 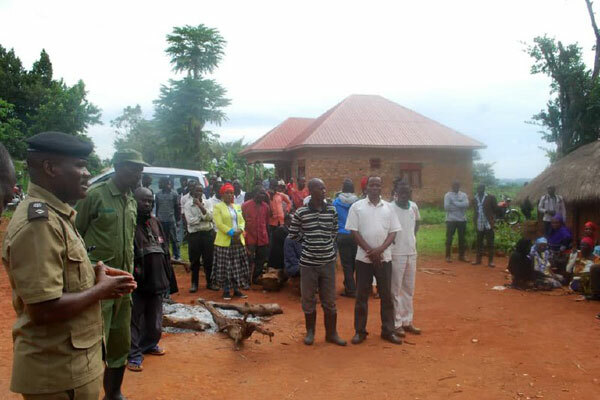 Residents of Bukulula in Kalungu District on Thursday woke to the shocking news of a 22-year-old man killing his mother and brothers over land. The deceased have been identified as Bena Nalwadda 80, Musitafa Gwalamubisi 70, and Vincent Kasolo the father of the suspect. Trouble started when Matia Kalimunda raided his father’s home and killed his brother Gwalamubisi. It is reported that Nalwadda heard the scuffle and came out to see what had happened and this is when her son Kalimunda, turned against her, hitting her with a hand hoe that killed her on spot. The police investigations indicate that the family has had land wrangles for some time now. It is said that the father Kasolo was killed by as he was trying to protect Kalimunda from the mob that had started beating him up. According to neighbour’s, Kalimunda has been asking for a share of land from his parents for so long. It is further reported that Nalwadda had given Gwalamubisi a part of the land, yet he is said to be a step son in the family. This did not please Kalimunda and these bitter conflicts resulted into the murder. Village members claim that Kalimunda was influenced by drugs as he is addicted to drugs and a known marijuana smoker who has on several occasions been reported to police. The Southern Region police Spokesperson, Lameck Kigozi said that police was forced to fire in the air in order to disperse the angry mob that had started punishing Kalimunda after also killing his father. Kigozi added that police rushed Kalimunda to Masaka Regional Referral Hospital where he is getting treatment.